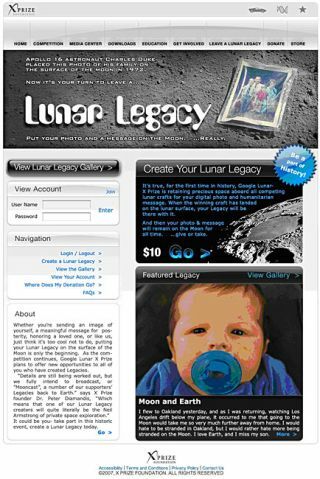 A screen shot of the Lunar Legacy home page, where users can submit a photo and message to go to the moon for $10. GOLDEN, Colo. – Silicon Valley giant Google Inc. is teaming with the X Prize Foundation to launch a commercial race to the Moon with $30 million in incentives to collect along the way. The X Prize Foundation, headquartered in Santa Monica, Calif., spearheaded the $10 million Ansari X Prize, which was created to jumpstart the development of private commercial transportation to suborbital space. That prize was won by Scaled Composites of California, which is now building a commercial version of its winning vehicle for entrepreneur Richard Branson’s Virgin Galactic Corp. The X Prize Foundation and Google Inc. announced the international competition today during Wired magazine’s NextFest festival in Los Angeles, which runs Sept. 13-16. The vision behind the concept — also dubbed Moon 2.0 as the second era of lunar exploration — is to have small robotic lunar explorers take the first commercial steps toward opening what the organizers believe to be a multi-billion dollar market for utilizing space resources beyond Earth, Diamandis said. “We don’t care where you’re from, what you’ve ever done, where you went to school … if you can build a rover that lands and roves on the surface of the Moon you will win the Google Lunar X Prize purse,” Diamandis said. According to the summary of the Google Lunar X Prize competition guidelines, the winning team must successfully land a privately funded spacecraft on the lunar surface that survives long enough to complete the mission goals: roaming about the lunar surface for at least 500 meters and sending a defined digital data package — called a “Mooncast” — back to Earth. The $30 million to be awarded is segmented into a $20 million grand prize, a $5 million second prize and a $5 million bonus. Contestants have until Dec. 31, 2012, to qualify for the $20 million grand prize, which will drop to $15 million for missions accomplished any time between Jan. 1, 2013, and Dec. 31, 2014. Teams will be required to send a Mooncast detailing their arrival on the lunar surface, and a second Mooncast that provides imagery and video of the journey roaming the lunar surface. Collectively, data sets broadcast from the Moon to the Earth must equal roughly a Gigabyte of content. Several strategic alliances have been established to support the new competition. Space Exploration Technologies Corp. (SpaceX) of El Segundo, Calif., for example, will give competing teams a 10 percent price reduction on a launch aboard one of its Falcon launch vehicles – identified as “the first preferred launch provider” for the competition in a Google Lunar X Prize press statement released today. Additionally, the SETI Institute of Mountain View, Calif., will make available its Allen Telescope Array to serve as a preferred downlink provider for communications from the Moon to Earth at no cost to competing teams. On the educational track, the St. Louis Science Center in Missouri will coordinate a worldwide network of museums and science centers to take part in the contest. The International Space University, based in Strasbourg, France, will conduct international team outreach and also facilitate the formation of a judging committee. Those teams participating in the Google Lunar X Prize will make use of Internet and modern communication technologies. Doing so will permit people around the globe to monitor the private Moon race and track those rovers that reach their lunar destination. A Lunar Legacy Program also has been introduced. With a $10 donation to the X Prize, participants will be allowed to upload a digital photo file and message to the winning Google Lunar X Prize vehicles traveling to the Moon. “The Google Lunar X Prize will allow every schoolchild, teacher and person on the planet to participate in going back to the Moon in a way that government exploration never could,” said Bretton Alexander, executive director of space prizes for the X Prize Foundation in Washington. “Government space agencies around the world will reap the benefits of the Google Lunar X Prize in that they will be able to explore the Moon and beyond much better for far less cost once the private sector becomes a part of exploration,” Alexander said.